Is your ship coming in today? Look toward the observatory tower and see if you can spot your flag! The Portland Observatory was built in 1807 by Captain Lemuel Moody. This octagonal tower served as a signal station for the merchants and ship owners of Portland, Maine. The city was built on a peninsula that juts into Casco Bay. Moody constructed his 86-foot-high observatory on Munjoy Hill, a high point on the eastern part of the peninsula. When it was first built, that area was a pasture. With a telescope and a stash of colored flags in the top of the tower, Moody could communicate with the entire waterfront in the busy harbor. Spotting incoming ships was the main purpose of the observatory. Each merchant had his own distinct flag. Moody or one of his employees would climb the 102 steps and watch the harbor. When a ship rounded Cape Elizabeth, they would observe its pennants and flags, then they would run up the flag of the merchant company to which the ship belonged, hours before it would dock. The owners watched the observatory anxiously to learn when their ships were nearly home. Moody’s coded flag system gave them time to reserve a berth for their ships on one of the many commercial wharves and have a crew of stevedores ready to unload the long-awaited cargo. Sailors’ wives and sweethearts also paid close attention to Captain Moody’s flags, you can be sure. Many times this was the first indication that their loved ones had survived another arduous voyage and were bound for home. The Portland Observatory is now the only extant maritime signal station in the United States. It ceased operation as a signal station in 1923. It was added to the National Register of Historical Places in 1972. In this modern photo from Portland Harbor, the observatory can be seen on the right. From 1998 to 2000, the building underwent restoration, after prolonged damage from seeping moisture and a beetle infestation. It became a National Historic Landmark in 2006. The organization Greater Portland Landmarks operates the observatory today as a museum and historical site, including guided tours. 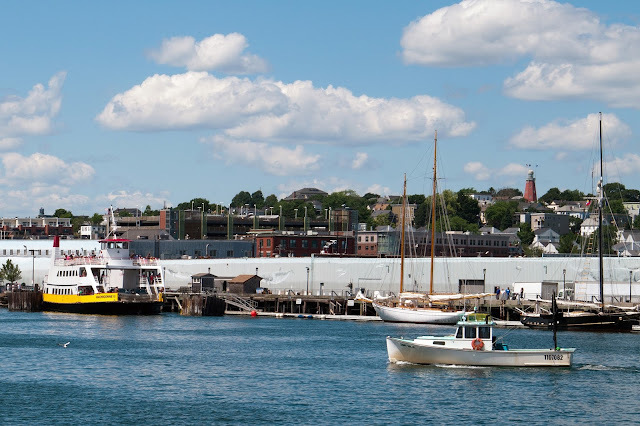 Visitors can look down on the city, Casco Bay, and as far west as the White Mountains of New Hampshire. The Portland Observatory is featured in my novel The Castaway’s Bride, set in 1820, the year of Maine’s statehood. This book is also part of the Maine Brides collection. In honor of Captain Moody and his observatory, I’m offering a giveaway of Maine Brides this week. The winner will be chosen by random draw on Saturday (Sept. 28). To enter, comment here. E-readers may choose an e-book of The Castaway’s Bride instead, if they win. I have always dreamed of living in a lighthouse. I also love the state of Maine. I just can't imagine climbing 102 steps, but I would do whatever it takes to experience living in a lighthouse and looking out to sea. Would love to read Maine Brides. Thank you for entering me in the giveaway. I know what you mean about all those steps! This wasn't a lighthouse, but the steps are probably about the same. It's truly an amazing piece of the past. If I had a choice, I would prefer the book. Thank you. Hi Susan. Good to see you on here today. interesting story in History. I would be happy to win your book. Love the Bride stories. Thanks, Maxine! Good to see you here, too. Loved this post. I had no idea about this part of history in Maine. Thanks for sharing. Would love to win the book! Thanks, Sally. It's something we don't think about much--and since it's the only marine observatory left, I guess modern day folks have forgotten this aspect of shipping. Good morning, Susan. I was in Portland this summer. Wish I'd known to look for the observatory. We did go out to the Portland Head Light. It was such a foggy morning that it was really obvious why a lighthouse was necessary. You couldn't even see the lighthouse itself until you were right up next to it. I'm missing Maine, so I'd love to be in the drawing for your book. Portland Head is maybe the most photographed lighthouse, I'm not sure. It's on my Maine Brides cover, I know that! I was at the lighthouse in Owls Head on a foggy day like that. The foghorn went off, and I think it was every two minutes. When we got close it really blasted your ears! Couldn't stand to stay near it long. That one and Port Clyde (the one in the movie Forrest Gump) are quite close together, so they made a nice day trip for us when we lived in Maine, and also we could take in the Owl's Head Transportation Museum. I'm fascinated by the history of sites such as the Observatory. Especially the flags that offered signals to families of their loved one's return! Thanks for sharing this piece of Maine's history. You're welcome, Anna. I'm into codes, flags, and the Signal Corps myself, so researching it was a lot of fun. Been to Portland once ! Use to live in NH. Would love to win. And read your book. Thanks, Linda. I have two sisters and their families in NH, and still lots of ties in Maine. Thank you so much for sharing this information about the Portland Observatory. I loved reading about its history and would love to win a copy of MAINE BRIDES! Thank you for the opportunity! I visited Maine for the first time last summer and I fell in love with the state. Its rugged, rocky shores and the stunning backdrops...beautiful! This post is so interesting. The observatory was such a useful tool. I can just imagine the many sets of eyes gazing at the flags to see the fate of their friends and loved ones. Thank you for this post and for the chance to win this wonderful book. Melanie, it caught my imagination too. I wish I could have seen it in the days of the sailing ships. I would love to win a copy, thank you! That would be awesome to see the view from the top! We just visited Big Sable Point lighthouse this past week and again it intrigues me in the lives of those who lived there and ran them. What a neat idea to be the first to let others know what ships were coming ahead of time. Great post! I love history. I've been to Maine one time many years ago and at that time the Portland Observatory would not have been ready for tourists. Hopefully, I will be able to visit Maine again and would love to see this piece of history. Thank you for sharing this history with us. I've always enjoyed your books. You're a terrific author. Please enter my name in the giveaway. Thank you!! Thanks so much for the giveaway. I love to learn more about different states and lighthouses are a favorite of mine! I love history! There is so much to learn about the past. I was not aware that the lighthouse also matched flags with ships. what a creative mindset they had to have back then. One could only imagine the relief they felt when their ship was spotted returning. Thanks for the history I found the article very interesting. Love your books! Thanks, Jackie. Actually, this was NOT a lighthouse. 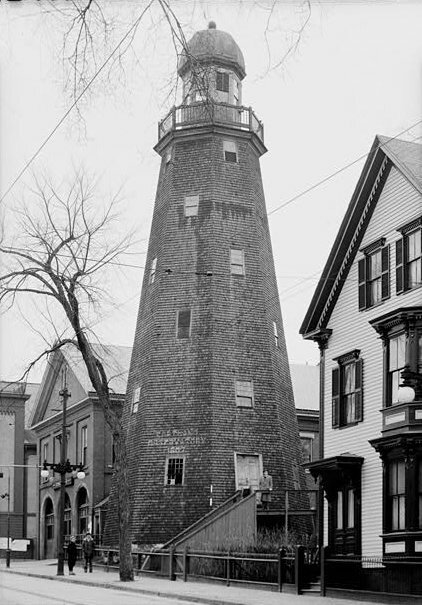 There are several lighthouses in Portland and Cape Elizabeth. This tower was strictly and observatory. I think about that a lot, Eliza--how blessed we are to have instant communication today, and how agonizing it must have been to wait for word of loved ones back then. I used to live in Portsmouth, NH and we were always going to Maine to sightsee and I know we went to Portland a few times but I don't remember seeing the Observatory. What a neat system they had worked out with the local businesses! I would love a copy of your Maine Brides book! My sisters and I spent a weekend in Portsmouth together once, and it has a lot of neat places too. The Observatory is easy to overlook. I'd been to Portland dozens of times and not even thought about it until I started researching the period. Love lighthouses - take pics of everyone I see. Would love to visit Maine - one of the few states I haven't seen - I've heard it is beautiful! I'm thinking Mr. Moody stayed in good shape, what with running up & down all those steps! Interesting post, Susan, thanks! I would love to read your book - thanks for the opportunity to win a copy! I think Captain Moody was fit as well, Bonnie. No need for a gym back then. What a fascinating piece of history! I just told my mom about this post and we decided to visit the observatory since we are so close. I loved reading Maine Brides, so please leave me out of the drawing. Blessings! Thanks, Carla. Hope you and your mom have a good time. (Hi to Mom!). And the winner of Maine Brides is ... Hattie Norman! I will contact you privately. Thanks everyone who participated!